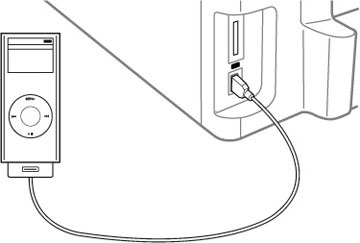 You can charge your cell phone, music player, or other portable device by connecting it to the product. All you need is a user-supplied USB cable that is designed to work with your device. Make sure your portable device complies with USB 2.0 standards. Devices that draw more than 500 mA may damage your Epson product. Epson cannot guarantee the compatibility of your device. Contact the device manufacturer for more information. Connect your portable device to the USB port on the front of the product. Leave your product turned on during charging (it will continue to charge even after going into sleep mode).